The sticky note—what a wonderful invention. I can write that important “thing” on this little note and stick it in view so I won’t forget. Sticky notes make the perfect bookmark, even letting me know which line I stopped reading at. I can stick that note right on the next line to read. I can add a sticky note to that report which needs to be copied X amount of times. Just bam, that note is stuck to the report. 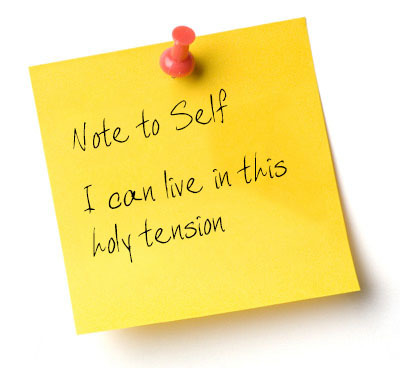 But the best use of sticky notes may be as an aid to help us live in the truth every day. We can take that 3”x3” square and write on it a statement of truth and post it on our mirrors—right where we need to hear—and see—the truth the most. That sticky note of truth can be stuck on our device to bam remind us of this truth just when we need it. Or it is stuck on the frame of our computer screen to remind us again and again and again as we proceed through the drudgery of the day. The truth is stuck right there for me to see whenever I look up and be reminded of the truth. In the long journey of overcoming shame and scarcity (and it is long and starts with pain), these sticky notes of truth cheer us on along the way. Can you imagine looking into your mirror and seeing this note cheering you on? This may change your mirror experiences. Ephesians 1:5 – I have been adopted as God’s child–in accordance with his pleasure and will. Colossians 1:14 – There is redemption for me, and forgiveness of sins. Colossians 2:10 – I am complete in Christ. Romans 8:1-2 – There is now no condemnation for me and because of Jesus I am free of the power of sin. Romans 8:35-39 – I cannot be separated from the love of God. Nothing will separate me. Romans 8:31 – If God is for us, who can be against us. Hebrews 4:16 – I can come boldly to the throne of our gracious God. There I will receive his mercy, and will find grace to help me when I need it most. There are so many verses which could be included here. I’m just getting you started. Read your Bible and find these many more. I can live in this holy tension. I can find Plan B.
God’s hold on you is stronger than your hold on him. And he has no intention of letting you go. God’s love is stronger than my roller coaster. Fear does not help me control my world. Find that sticky note pad and put it to good use. You will overcome.